1 In a small pot, cook rice in salted water according to package directions until tender. Meanwhile, peel the carrots. 2 Cut bell pepper into quarters, remove seeds, rinse and pat dry. Chop cashews. Rinse cilantro and shake dry. 3 Cut carrots and bell pepper into thin strips. 4 Peel and finely grate ginger root. Peel and press garlic cloves through a garlic press. Rinse mung bean sprouts in cold water and drain. 5 Rinse limes in hot water, wipe dry and cut into wedges. Whisk egg and soy sauce in a bowl. 6 Heat 1 tablespoon oil in a nonstick skillet, pour in egg mixture and cook until set. Remove omelet and cut into strips. Wipe out the skillet. 7 Heat remaining oil in the skillet. Add garlic, ginger, bell pepper and carrot and cook until softened, 2-3 minutes, turning frequently. 8 Drain rice and add to skillet along with bean sprouts and cook, stirring, until evenly distributed, 2-3 minutes. 9 Mix shrimp and egg into rice and cook until heated through. Season with salt and pepper. 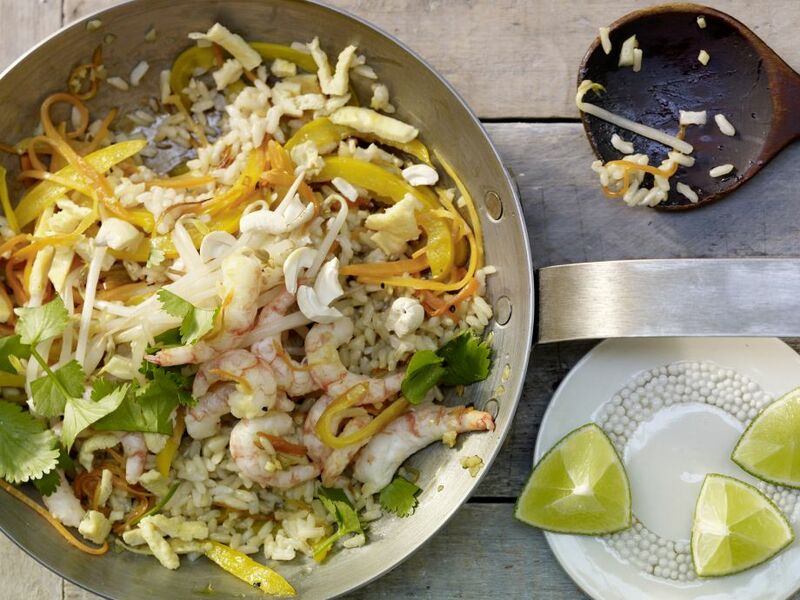 Chop cilantro and sprinkle with cashews over the rice, garnish with lime wedges and serve.